Press — Adel Atelier, a full-service hair salon in New York City. Now a styling signature at his airy new Upper East Side salon, Adel Atelier—where industry icons like French film star Fanny Ardant, supermodel Coco Rocha, and the Clueless queen of hair-toss-worthy roller makeovers, Alicia Silverstone, frequent to have their lengths twirled around the plush curlers—Chabbi touts their ability to not only pump up but also protect strands. “You don’t have to use as much heat to create an incredible lift, plus they don’t pull and tear at hair like old-school Velcro rollers,” he says, adding that the shine and silky texture that result are unmatched. And though it may have required a pro like Chabbi to initially acquire the velour wonders, which are now sold at his salon, it doesn’t take a master to approximate his gravity-defying results. “Right after blow-drying, wrap sections of hair around the velvet curlers (the red color is great for weightless body), hold in place with a straight pin, and allow 10 minutes for everything to set and cool,” Chabbi says as he breaks down the steps with an encouraging dose of you-can-do-it insouciance. “Then, remove them and finger comb—don’t brush!—your hair in multiple directions, and finish with a bit of texture spray or wax.” The result? 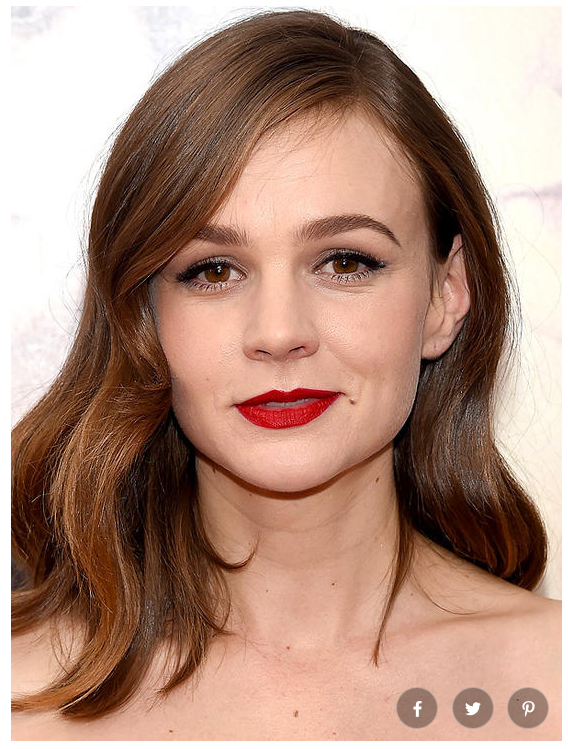 The hyper-extended bounce of a fresh blowout in half the time, with half the effort. And for those unable to make the trip to Adel Atelier to snag a set and enjoy a cappuccino on the charming backyard patio before it’s time to trade gifts, a quick French-to-English translation of Delorme’s site is all it takes to delight every Francophile in town—or simply to hold the coveted title of Most Popular White Elephant Party Pro. If your hair has lost its youthful volume, give it a boost with extensions. For those with thinning hair, Chabbi recommends choosing extensions with some wave and body to them, which can make your hair look even thicker. If you can't make it to the salon or the cost is out of your budget, a great DIY option is Hairdo 23” Wavy Clip-In Extensions ($99), which give hair instant texture and natural-looking fullness. 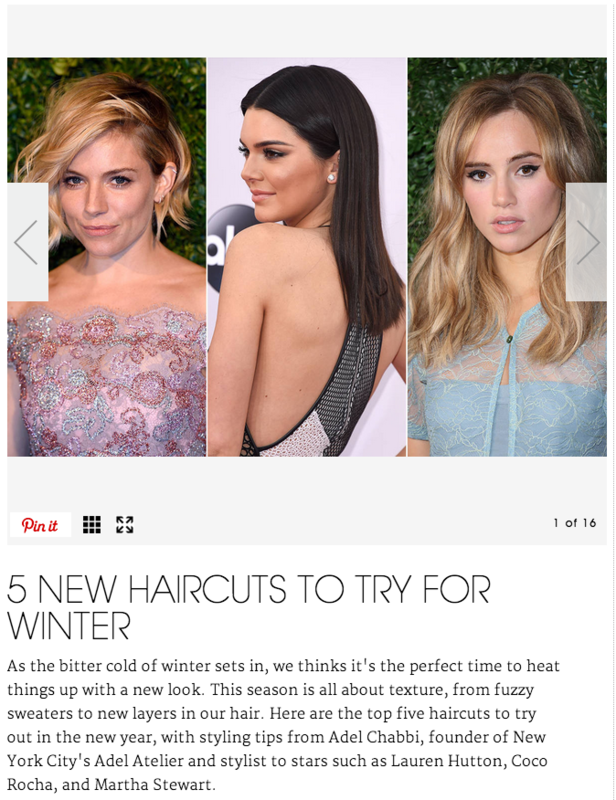 Adel Atelier Featured in People Style Watch - 7 Hot Fall Haircuts! Price: $50 or complimentary with a color service or cut. What It Is: Step inside this recently relocated boutique salon to experience an all-natural conditioning treatment that’s applied to dry hair for maximum absorption. All three steps of the process smell heavenly, and the third step involves actual Shea butter imported from France. Hair looks shinier and feels healthier immediately, and will stay that way for weeks to come. From bobs to long layers, there's inspiration for everyone in this gallery of great looks for the season. To kick of Fashion Week downtown, Adel Atelier styled the models of the LES Art + Fashion Show with creative, unexpected looks that had everyone talking. Check out these choice photos, then click through for the full story. Quest Magazine calls Adel "A Stylist to LOVE"
It's always a good day when the magazine of "Society and Culture in New York, The Hamptons, Greenwich and Palm Beach" declares its LOVE for you. Thanks Quest! "Adel Chabbi—whose stripes as a stylist were earned with the likes of Frederic Fekkai, Louis Licari, Phyto, and Pierre Michel—is offering his experience with uptown girls to the Lower East Side at Adel Atelier. Located at 96 Orchard Street, an area brimming with edge and energy, the salon caters to the gal on the go, whether she’s between classes at NYU or between shows at Fashion Week. The stylist started to work with hair at the age of 13 in Lyon, France—and his career was fast to flourish. Soon, he was on set, styling actors and models for shoots that would be seen in magazines and newspapers throughout the country, and throughout the world. His accolades—which are extensive—include spots on Fox 5 News and the Today Show and clients such as Lauren Hutton, Coco Rocha, and Martha Stewart. Today, Adel Chabbi is entering a new stage in his career in the form of Adel Atelier. He is available around the clock, delivering on styling services that range from cuts to extensions. Oh, did we mention his team of top-notch colorists? And don’t forget his line of must-have products…"
Allure asks Adel for a lesson in long locks - Hair Extensions 101! You can imagine our excitement when Allure magazine chose us as their expert source on all things hair extensions! Continue reading on Allure.com for everything you'll ever need to know about the process! 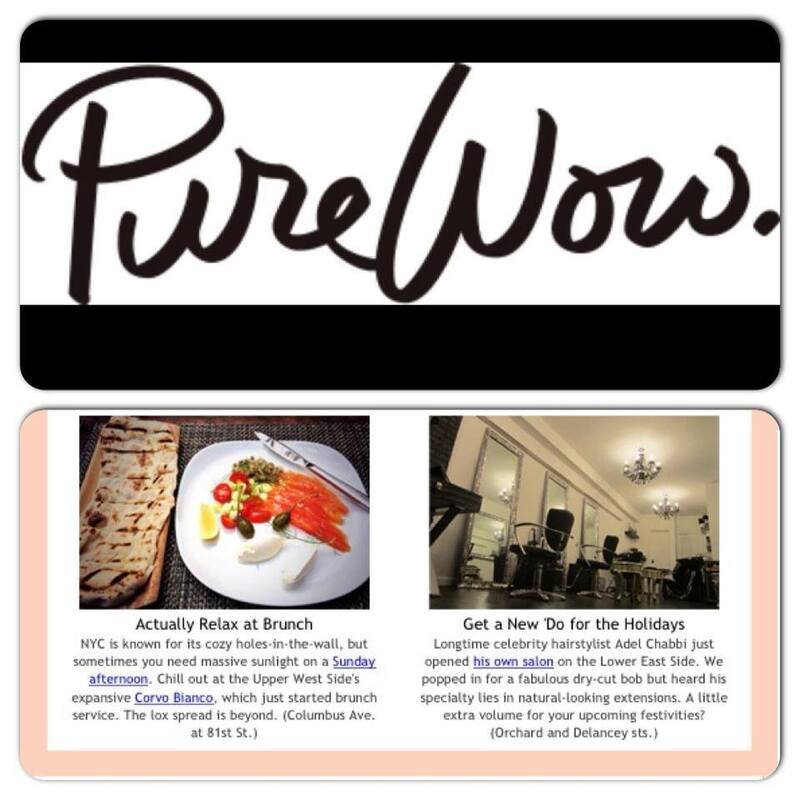 Adel Atelier Salon feature in PureWow - Get a new 'do for the holidays! Rouge 18 reviews Adel Atelier Salon - Julia leaves feeling like a celebrity! 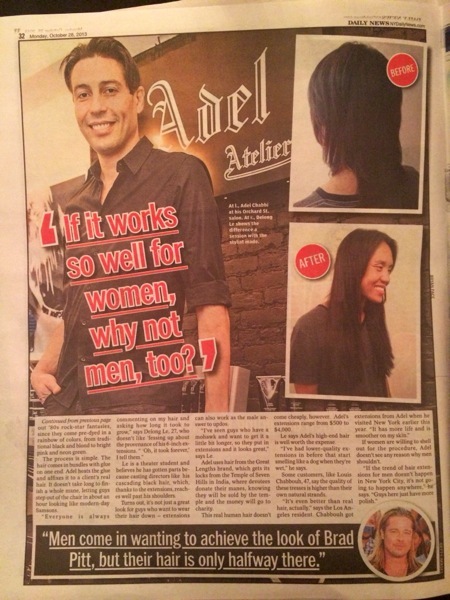 Adel Atelier Hair Extensions Featured in New York Daily News! We're on the map! Time Out New York stopped by earlier this month and did a lovely write-up on us, covering everything from Adel's famous extensions to our specialty dry cuts. Be sure to grab some of the house-line products, such as sulfate- and paraben-free shampoo ($22), conditioner ($22) and volumizing spray ($19). For those of you who are already happy customers - don't be shy! Spread the love by commenting on the Time Out article to tell all of NYC why you keep coming back. Thanks Time Out for taking the time to get to know us!